Do you exercise? As you grow old, there is high possibility that you will give up on doing exercises. Despite the notable health benefits of exercise more than half of seniors don’t do any exercise at all. Only one out of four persons between the ages of 64 and 75 exercises on a regular basis. What happens is that as you age, your mind starts taking excuses such as: “I am too tired, too out of shape or sick or I will fall or just plain too old to exercise”. You’re wrong. The fact is exercise is always good for people of any age. It helps to make you stronger, avert bone loss, boost your balance and coordination capabilities, uplift your mood, improve your memory, and alleviate the symptoms of many chronic medical conditions. It may be that you are over 50 or 60 or even 70 and want to start exercising and don’t know what to do? Continue reading this article. I have put together in this article some expert advice on how an individual body and fitness needs change as one age. I will also tell you about the exercises and workouts that work best for older people. Why Old People Should Exercise? Exercising is one of the best anti-aging activities for your body. It’s universally acknowledged that with age, we begin getting weaker, slower and more fragile. Good news is that a number of research studies have established that when it comes to body fitness, if you use your body more, the less quickly will be the fitness loss. And, the cellular process of aging will also be much slower and you will enjoy a much better quality of life in your later years. Cardiovascular Endurance The elderly people can use treadmills. They are easy to use and can really help to boost up not only cardiovascular fitness, but also balance because they have rail to hold to help maintain balance. Other good options to build cardiovascular endurance are elliptical machines and bicycles. For those who have no access to a gym or these machines, here are the various best options for them – cardio exercises for the older adults. Bone Density Exercise is the best method to build stronger bones, and it’s never too late – or too early – to start exercising. Exercise plays a key role in building and preserving bone mass and strength. It’s same like muscles, bones get strong when they are stressed – in simple words when they are compelled to bear load more than they are used to. Workout can keep at bay the bone-thinning effect that occurs because of aging. Bone grows stronger in response to weight-bearing exercise and loading. Many studies have found that strength training and weight lifting can increase bone mass, particularly in the spine. To counter the bone thinning effect of aging follow these guidelines. Following exercises are recommended for maintaining and building bone density: Squats, Overhead presses, Chest Presses and Lunges. Warm-up: Warm up for 8-10 minutes on a treadmill, bicycle or walking – alternating 2 minutes of easy movement with 2 minutes of hard movement. Stretching And Flexibility: Do full body-stretching exercises (a) Follow these guidelines for stretching (b) Here is how to make you more flexible by doing stretches (iii) Here you can find strength training exercises that you can do in old age. Full Body Workout: Do a full body workout 3-4 times a week. Make sure you cover every muscle group in rotation. Remember, you can start exercising at any age, it’s never too late! So, get up and start from today!! 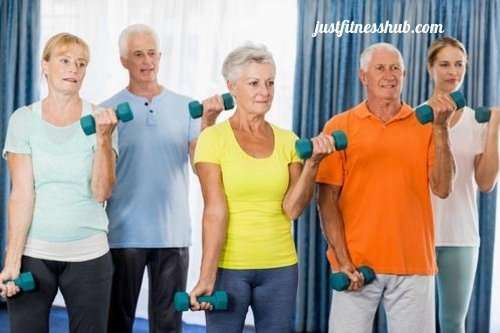 If you have any tip regarding senior fitness; please share under the Comments section below.